Well the DFV Kickstarter project has approximately 24 hrs to go as I write this and it has been an unmitigated disaster. We’re talking about choking so hard that if our project had been named after a South Park character, it’s name would be Ms. Chok….. okay, I wont go there, you can look it up yourself. This is a fail of epic proportions, not even horseshoe or hand-grenade close. How far off the mark are we? Donations haven’t even hit 10% of the funding goal, but as Fozzy Bear taught us in the latest Muppets movie, this is better than falling short by 10%. So unless Ellen DeGeneris or some other vegan-friendly angel with $7 G’s of disposable income to drop on a start-up is reading this……..
……….and maybe we’ll win the PowerBall too……….. Fear not loyal DFV’ers this not but a small set back, a speed bump in the road of life, nothing but a flesh wound! The man ain’t gonna keep us down and we gonna do our thang because that’s how the D family rolls. I won’t lie and tell ya’ that maintaining enthusiasm in the face of apathy is easy but with plenty of the world’s favorite psychoactive drug we’ll manage (emphasis on the psycho!). We were going to need more than traditional iced Americano’s to power through this summer. 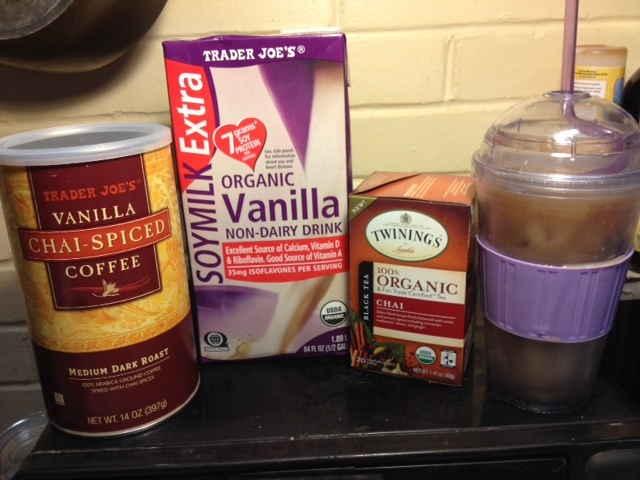 Trader Joes has a new Chai-Spiced Coffee and it’s pretty damn tasty. Somebody get Howard Schultz on the line, this recipe is worth 7 grand! The only real advice I have here is make the coffee and tea in advance so you have time to put them in the fridge to cool down before icing. We want to thank all the good folks who showed up and supported, with special shout outs to Doh, Levi & Travis we appreciate everything you have done for us. For those who didn’t donate, we understand, you’re in pretty good company and we love you all! To everybody who doesn’t have access to a TJs, sorry. If you’re willing to cover the costs, we’ll ship it to you.